This has become Watt’s most popular and widely viewed photo to date. It was taken on a foggy February day in a haunting clearcut near the Avatar Grove. It has since been printed in multiple books, magazines, and museums and was recently awarded second place in the International Conservation Photography Awards ‘Natural Environment at Risk’ category. Photo by: T.J. Watt. The common adage—a picture is worth a thousand words—comes instantly to mind when viewing T.J. Watt’s unforgettable photos of lost trees. For years, Watt has been photographing the beauty of Vancouver Island’s ancient temperate rainforests, and documenting their loss to clearcut logging. The photographer and environmental activist recently helped co-found the Ancient Forest Alliance (AFA), a group devoted to saving the island’s and British Columbia’s (BC) last old-growth while working with the logging industry to adopt sustainable practices. This February the organization succeeded in saving Avatar Grove—which was only discovered in 2009—from being clearcut. The grove—a rare stand of massive and ancient trees named after the popular eco science-fiction movie—has become a popular tourist destination, providing a new economic incentive for communities to protect rather than cut Canada’s last great forests. 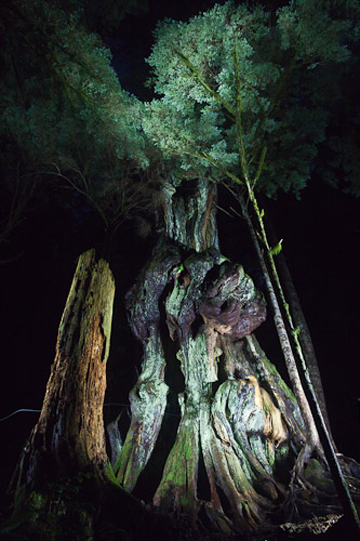 This is a night photo of ‘Canada’s Gnarliest Tree’ in the Avatar Grove. Watts says: ‘Some friends and I thought it would be neat to go for a hike and photograph in the dark with lights. It was quite the surreal experience!’ Photo by: T.J. Watt, Utopia Photo. “If we have laws that recognize and protect Heritage Buildings that are 100 years old, why don’t we have laws that recognize and protect our 1,000 year old Heritage Trees?,” Watt told mongabay.com in a recent interview. Watt’s organization, the AFA, wants the logging industry in British Columbia to switch from clear-cutting old-growth forests to logging only in secondary forests with more sustainable regulations. “The vast majority of forested lands in southern BC are now second-growth, including about 80 percent of the productive forest lands on BC’s southern coast. A full transition into only logging second-growth forests is inevitable when the last of the unprotected old-growth forests are logged out. 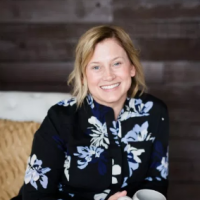 For the sake of future generations, we need to make the full transition into a second-growth, value-added forest industry now, before we eliminate the remaining unprotected old-growth forests,” says Watt. The AFA wants the logging industry in British Columbia to switch from clear-cutting old-growth forests to logging only in secondary forests with more sustainable regulations. On Vancouver Island, where AFA and Watt, are stationed, 75 percent of old-growth forests have been lost. In addition, says Watt, “90 percent of the valley bottoms where the biggest trees grow and richest biodiversity resides” have been logged. Not everything worth saving is gone though—not by a long shot. In 2009, Watt stumbled on Avatar Grove. Watt says: ‘I snapped this candid photo of a German tourist who had flown across the world just to see the giant spruce trees of the Carmanah-Walbran Provincial Park. His amazement and wonder while arriving at of the first big stands of trees was beautiful.’ Photo by: T.J. Watt, Utopia Photo. 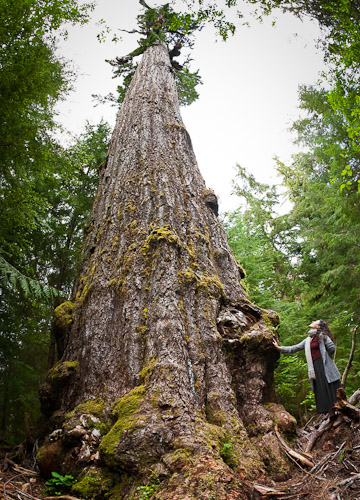 “Port Renfrew is making a name for itself as the ‘Big Trees Capital of Canada’ and people are traveling from all around to see the record-sized trees,” says Watt. 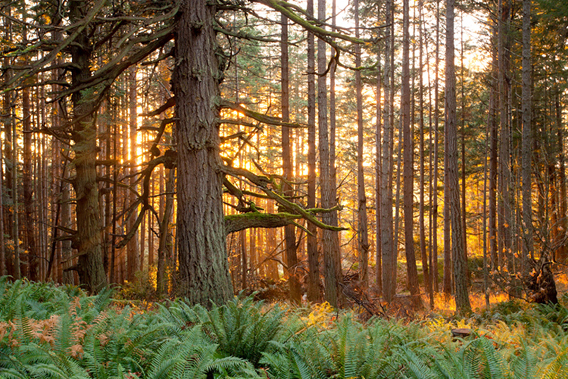 Next up, though, is the larger battle to save old-growth forests across British Columbia. Watt, who describes himself as a “big tree hunter,” travels far and wide to take photos both of ancient trees and the logging that destroys them to raise awareness of what’s happening beyond society’s watch. 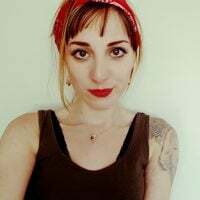 “Many folks are also somehow under the impression that old-growth logging ended years ago when it’s still happening on a large scale! 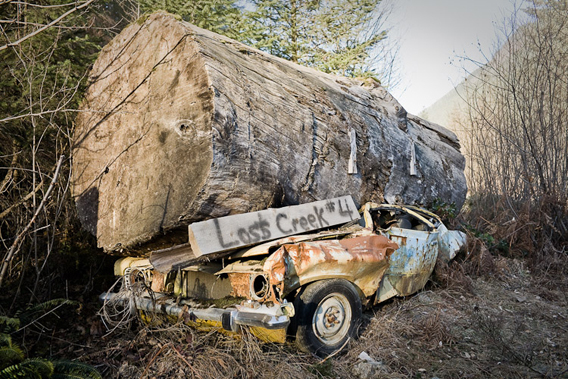 By sharing powerful photos of the giant stumps and sprawling old-growth clearcuts it thrusts this backwards practice into the local and global spotlight,” Watt explains. Watt goes on to say that while he finds documenting such destruction “painful,” he uses that emotion to propel him to action, instead of ambivalence. In a July 2012 interview, T.J. Watt discusses the importance of British Columbia’s old-growth forests, the wild species they shelter, and the broad effort, including his eye-opening photography, to save them from felling. Watt says: ‘A cool, wintery view of the Gordon River Valley. 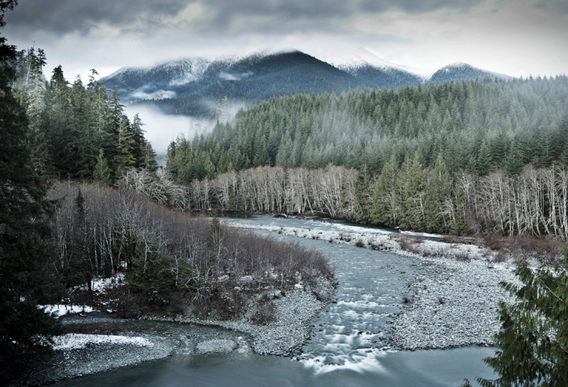 An area home to cougars, wolves, bear, elk, salmon, giant trees, and more.’ Photo by: T.J. Watt, Utopia Photo. 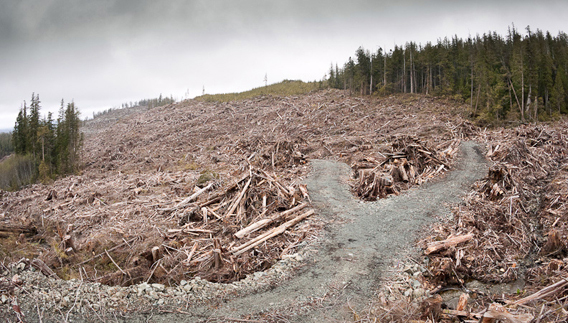 Mongabay: Will you give us some background on the struggle to save forests on Vancouver Island? T.J. Watt: The quest to protect Vancouver Island’s ancient forests has involved large scale public protests for three decades now. Few other issues can rally as many people into the streets in British Columbia (BC) than this one. Thousands of people have showed up at rallies in Victoria for ancient forests in recent years and over 12,000 people showed up for the protests in Clayoquot Sound near the town of Tofino through the summer of 1993, with almost 900 people being arrested for non-violently blockading the logging trucks. Mongabay: Why are ancient forests and big trees important? T.J. Watt: British Columbia is home to the biggest trees in Canada. These centuries-old giants can grow as wide as living rooms and as tall as downtown skyscrapers and the ancient forests are home to many endangered species. Old-growth forests provide clean air and water for both people and salmon; they help mitigate climate change by storing twice the amount atmospheric carbon that second-growth plantations do; they are pillars of a multi-billion dollar tourism industry; and are important to many First Nations cultures. They’re what make BC, BC—a place of wild beauty with the finest remaining intact ancient temperate rainforests on Earth. 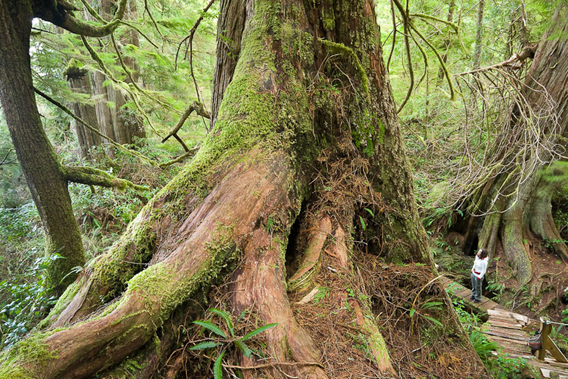 Mongabay: What other species are found in Vancouver Island’s ancient forests? T.J. Watt: Vancouver Island’s forests are home to many large and charismatic creatures such as wolves, bears, Roosevelt elk, and black-tailed deer. The island also has a significant population of cougars, though you are unlikely to ever see one. In the canopy of old-growth forests nests the marbled murrelet, an endangered seabird that cannot grip the tiny second-growth branches with its webbed feet and therefore must nest on the wide mossy limbs that only old-growth trees have. Long-eared bats and the Vaux’s swift, a swallow-like bird, also live in hollow old-growth trees. Black-tailed deer that live at the higher elevations where there is a lot of snow spend the winter in old-growth forests where they find food and shelter. There was also a distinct subspecies of wolverine once living on Vancouver Island but is now thought to be recently extinct due to development pressures. You might find the odd Sasquatch or lost hippy too! 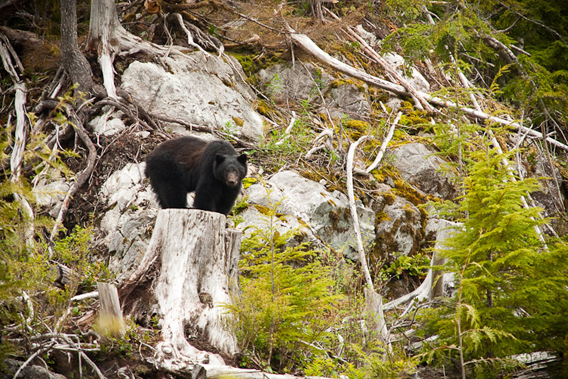 A mother black bear stands upon a stump in the unprotected Upper Walbran Valley on southern Vancouver Island. Black bears typically spend their winters hibernating in the hollow trunks of old-growth red cedar trees to stay dry. 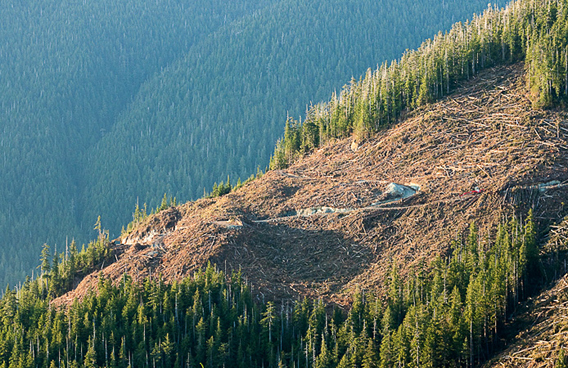 Old-growth logging is now targeting many of the last stands of these giant trees. Photo by: T.J. Watt, Utopia Photo. Mongabay: Do you believe there should be a total ban on old growth logging on Vancouver Island? What about in the rest of British Columbia? T.J. Watt: Most of the old-growth forests in southern BC have now been logged, so we’re saying that we must protect what little is left and ensure the industry sustainably logs second-growth forests instead, which are now the vast majority of forests down here. 75 percent of Vancouver Island’s productive old-growth forests have already been logged including 90 percent of the valley bottoms where the biggest trees grow and richest biodiversity resides, an even higher fraction has been lost on the southern mainland coast and interior. The rest of the industrialized world is logging second, third, and fourth-growth forests, and we must do the same here while ensuring that we process and value-add the second-growth logs in BC to create more jobs in our own communities. T.J. Watt: The Ancient Forest Alliance has called for the creation of the Provincial Heritage Tree Designation that would identify and immediately protect the 100 largest and oldest specimens of each of BC’s tree species. Currently there is no provincial legislation that specifically protects the largest or oldest specimens of BC’s world-renowned old-growth trees. If we have laws that recognize and protect Heritage Buildings that are 100 years old, why don’t we have laws that recognize and protect our 1,000 year old Heritage Trees? But most importantly we need new laws that protect our last old-growth forest ecosystems—while big trees are great, it’s the ecosystems that fundamentally matter. Mongabay: Your organization is also devoted to sustainable forestry jobs. How do we balance conservation with forestry? 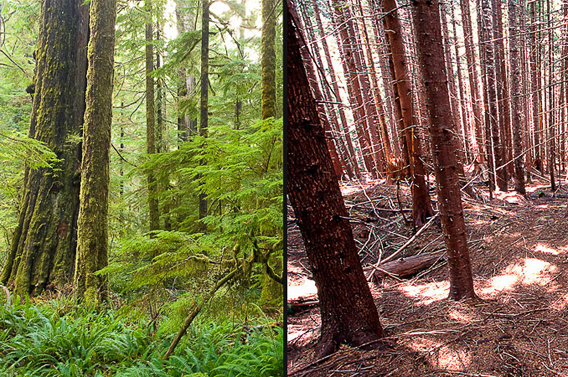 Watt says: ‘Seen here is the striking contrast between an old-growth forest (left) and second-growth forest (right). Old-growth forests have gaps in their canopies which lets more light in to the forest floor creating a much more luxuriant understory while second-growth forests tend to have a closed canopy and shade much of the light for other plants. You can clearly see why it’s more than a tree issue here. It’s an ecosystem at stake.’ Photo by: T.J. Watt, Utopia Photo. T.J. Watt: The vast majority of forested lands in southern BC are now second-growth, including about 80 percent of the productive forest lands on BC’s southern coast. A full transition into only logging second-growth forests is inevitable when the last of the unprotected old-growth forests are logged out. For the sake of future generations, we need to make the full transition into a second-growth, value-added forest industry now, before we eliminate the remaining unprotected old-growth forests. By logging second-growth stands at a slower, more sustainable rate of cut, and manufacturing more wood products here in BC —rather than increasing the export of raw logs to foreign mills—we can protect old-growth forests and sustain and create forestry jobs at the same time. Mongabay: What is your vision of sustainable forestry? T.J. Watt:It’s a vision where we can see jobs, communities, and ecosystems flourish simultaneously. The coastal forest industry’s 20-year decline at its root has been driven by resource depletion as the largest ancient trees in the valley bottoms and lower slopes have been largely logged-off. This has resulted in diminishing returns as the remaining trees get smaller, lower in value and more expensive to reach high up mountainsides and far away in valley headwaters. The resulting loss of tens of thousands of rural jobs has also been paralleled by the increasing collapse of BC’s old-growth ecosystems, with plummeting salmon, steelhead, black-tailed deer, cougar, mountain caribou, marbled murrelet and spotted owl populations. A sustainable forest policy will be based on logging second-growth forests, while protecting our old-growth forests; entail a reduced rate of cut so that coastal logging rotations are at least over 250 years, not 60 years as they are now; involve selection logging on the coast instead of clearcutting; will involve ecosystem-system based management where sufficient amounts of each forest type are placed off-limits to logging to ensure that the ecosystem can viably support all native species including having adequate riparian buffer zones to protect streams and fish; and will accommodate First Nations cultural and environmental interests and land-use/conservation plans. An old-growth clearcut just outside the boundaries of the Carmanah-Walbran Provincial Park. Photo by: T.J. Watt, Utopia Photos. Mongabay: Will you tell us about Avatar Grove? How did you find this place? T.J. Watt: The Avatar Grove near Port Renfrew is an enchanting place. It’s the most accessible stand of monumental old-growth forest still found in a wilderness setting on southern Vancouver Island. It’s filled with giant, alien-shaped redcedars—some with tree trunks wider than 14 feet—as well a rare, old-growth Douglas-fir trees. 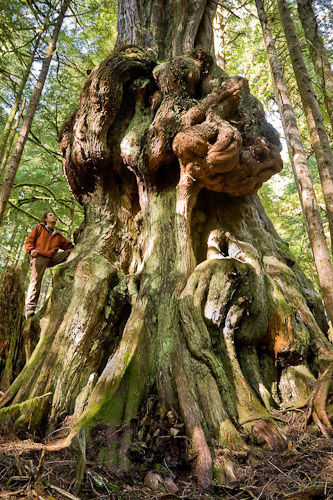 It’s also home to “Canada’s Gnarliest Tree”, a redcedar with a 10 foot wide burl on its side! A friend and I discovered the grove in late 2009 while out looking for big trees in the Gordon River Valley on southern Vancouver Island. Shortly after that it was flagged for logging. 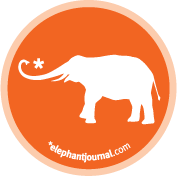 Thus began the Ancient Forest Alliance’s 2-year campaign to save it! Mongabay: When was the Grove saved? An alien-shaped old-growth red cedar nicknamed ‘Canada’s Gnarliest Tree’ in the now-protected Avatar Grove. Watt says: ‘This shot became the face of our organization’s successful bid to protect the area and the tree has likely become the most photographed in BC’s woods during the past decade.’ Photo by: T.J. Watt, Utopia Photo. forest and enhance visitor access and safety. Mongabay: What has it meant to local people? 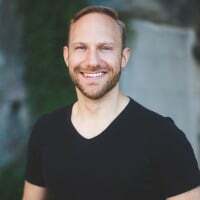 T.J. Watt: The protection of the Avatar Grove means there is a long-term, sustainable eco-tourism destination for the town of Port Renfrew, which will funnel millions of dollars into the local economy over the coming years. The alternative was a short-term logging operation that would have provided a few weeks employment to a handful of people—and the loss of the greatest natural asset near the town. Had the Avatar Grove been logged, Port Renfrew wouldn’t have had another chance like this for another 500 years. Mongabay: What is big tree tourism? T.J. Watt: Port Renfrew is making a name for itself as the “Big Trees Capital of Canada” and people are traveling from all around to see the record-sized trees. Aside from the Avatar Grove, nearby you also have the world’s tallest Douglas-fir tree, the Red Creek Fir, as well as Canada’s biggest spruce tree, the San Juan Spruce. A few hours drive to the north, you also have Canada’s largest tree, the Cheewhat Giant. For a town like Port Renfrew with a long history of logging, this type of tourism provides a transition away from a resource-based economy to one based on old-growth protection and recreation. Bottom line—the trees are worth much more standing up than lying down. Mongabay: To many people trees may seem like static objects and therefore uninteresting to photograph. What made you want to photograph trees? T.J. Watt: I’m simply fascinated by big trees and the allure of trying to find them hidden amongst the rugged coastal landscapes of BC. I love the wild style they exude, the blends of earthy colors, their twisting branches and patterns of bark, and the unique location that each happened to start growing at so long ago. Every tree is a different character that holds a powerful yet gentle presence after living a life of hundreds or even thousands of years. 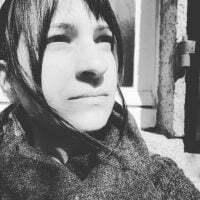 Standing quietly beside something that’s been alive for so long always helps to put into perspective the trivialities and silly stresses of your own life as well. It’s the best medicine for a busy world. 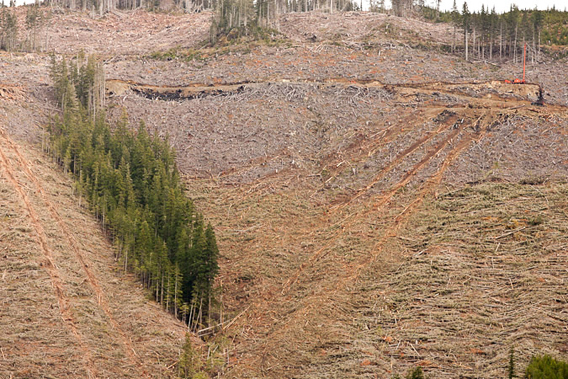 Mongabay:How do you think photos of vanished places, such as yours of clear-cuts, help instill environmental awareness? 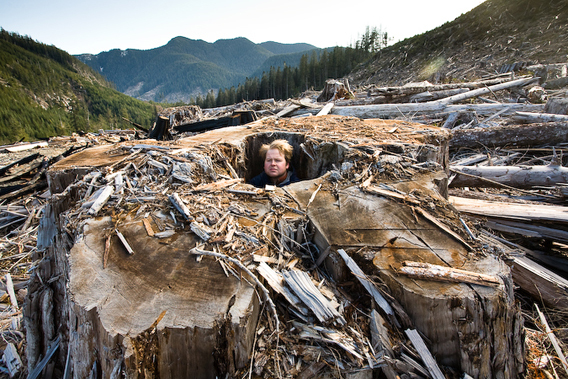 T.J. Watt: Nearly all the logging of BC’s ancient forests now takes place in remote valleys away from the public eye. There’s virtually no one other than myself dedicating substantial time to drive the back roads and hike the clearcuts in the hopes of documenting what’s happening. Many folks are also somehow under the impression that old-growth logging ended years ago when it’s still happening on a large scale! 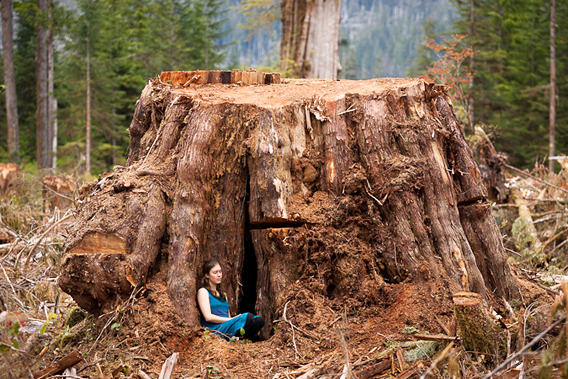 By sharing powerful photos of the giant stumps and sprawling old-growth clearcuts it thrusts this backwards practice into the local and global spotlight. Through online photo galleries, Google Earth, social media and high-profile news articles, the citizens of Canada and the world over are able to see what’s truly happening in our forests and find out how they can help save them. Mongabay:Do you find it difficult, emotionally, to photograph stumps of once giant trees? A hollow red cedar stump cut in the late 2000s in the Gordon River Valley on southern Vancouver Island. Photo by: T.J. Watt, Utopia Photo. T.J. Watt: It’s definitely disheartening and painful to see an incredible intact area turn into an unrecognizable sea of stumps and slash. There’s a complexity, a tapestry of connectivity formed in these ancient forests over the hundreds or thousands of years of evolution that is somehow so instantaneously lost. From that frustration and sadness though, you need to learn to take your emotion and convert it into something useful. Funnel it into action that can hopefully stop the same thing from happening again elsewhere. 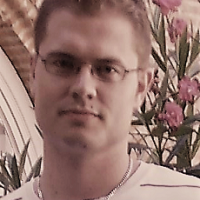 I sometimes compare it to being a doctor in a war zone. You could sit and panic about all the chaos and bloodshed going on around you and not help a single soul. Or, you could collect yourself, make a plan and use the abilities and knowledge you have to try and help as many people as possible. In my case it’s simply ecosystems instead of people, but every one of us depends on a healthy planet for our very survival so I guess in the end it’s one and the same. The Red Creek Fir is the world’s largest Douglas-fir tree. Stretching more than 242ft (73.8m) tall with a trunk diametre of 13′ 9″ (4.2m), it is thought to be over 1000 years old. It grows in the San Juan Valley near the town of Port Renfrew on Vancouver Island, just 2.5 hours from the capital city of Victoria. Photo by: T.J. Watt, Utopia Photo. 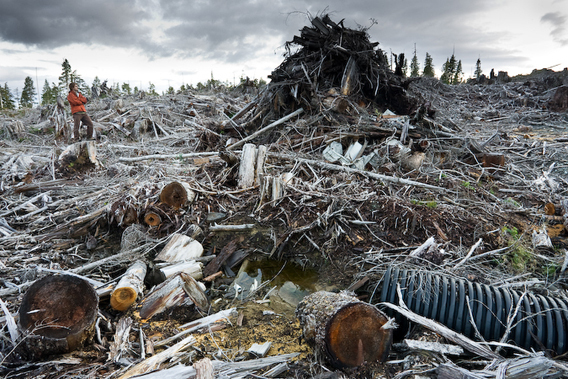 Watt says: ‘Here I stood in on my own photo to provide perspective to the piles of waste wood left behind in a typical clearcut.’ Photo by: T.J. Watt, Utopia Photo. Watt says: ‘This photo is a tribute to the great old-growth Coastal Douglas-fir forests that once covered most of eastern Vancouver Island. Now ranked as the 4th most endangered ecosystem in all of Canada, it is home to many rare plant and animal species. Having the chance to watch the sunset behind this beautiful giant tree while sitting in a bed of ferns was pure magic.’ Photo by: T.J. Watt, Utopia Photo. Watt says: ‘In this image, deep scars can be seen on a steep hillside after logs have been hauled out of a clearcut along the McLaughlin Ridge near Port Alberni. Biologists have classified the area as critical habitat for wintering deer as well as nesting Queen Charlotte goshawks but logging company Island Timberlands still holds plans to log further along the ridge.’ Photo by: T.J. Watt, Utopia Photo. 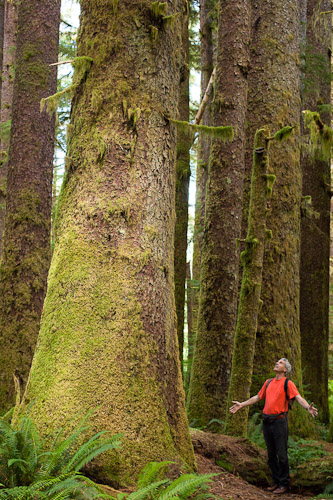 Watt says: ‘The Big Tree Trail on Meares Island in Clayoquot Sound, BC is a big tree heaven! A wooden boardwalk winds though dozens of mammoth sized red cedars and lush temperate rainforest that still stands today due to efforts in the 80s and 90s by the public and First Nations to halt logging.’ Photo by: T.J. Watt, Utopia Photo. 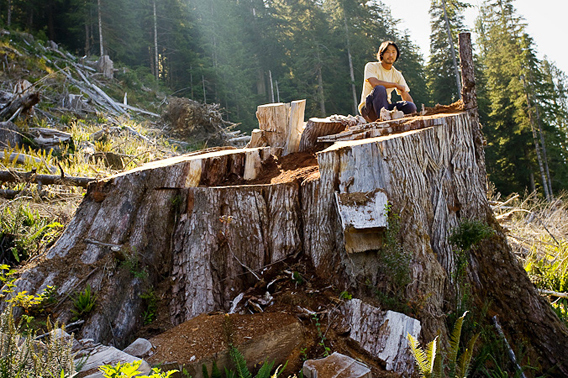 Ken Wu, the Ancient Forest Alliance’s executive director, sits perched on a 14ft wide red cedar stump in the unprotected Upper Walbran Valley on Vancouver Island. Photo by: T.J. Watt, Utopia Photo. With 90percent of Vancouver Island’s valley bottom old-growth forests logged, companies are continually moving further up hillsides to get the last of what remains of the original forest ecosystems. Photo by: T.J. Watt, Utopia Photo. 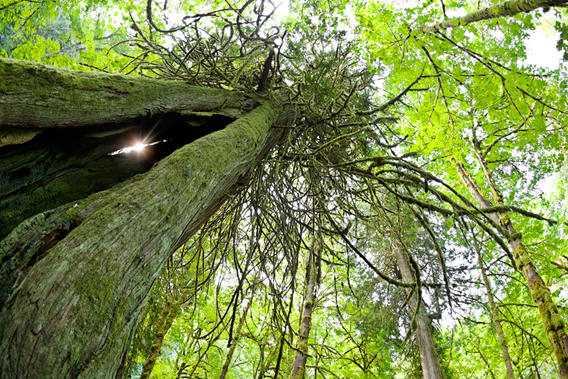 Sun-shining through a crack in an ancient red cedar in Goldstream Provincial Park. Watt says: ‘Some days you are just in the right place at the right time. This was one of those days.’ Photo by: T.J. Watt, Utopia Photo. This was a giant, 15ft wide red cedar stump that we discovered in the summer of 2011 cut down in the Klanawa Valley not far from the West Coast Trail. BC’s last giants still fall victim to the saw due to the lack of a provincial old-growth policy that would see these endangered forests protected. Photo by: T.J. Watt, Utopia Photo. 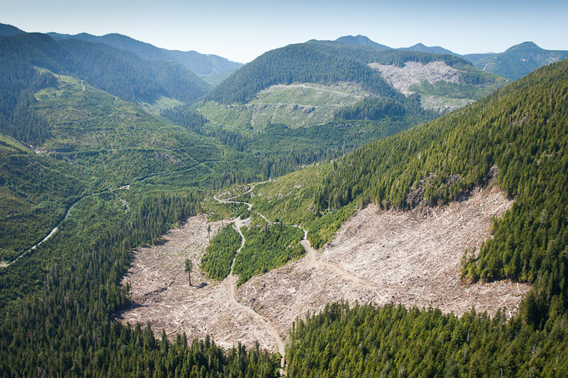 An aerial view taken over a recent clearcut located within the last 4percent of valley bottom old-growth that remains on southern Vancouver Island. Photo by: T.J. Watt, Utopia Photo. 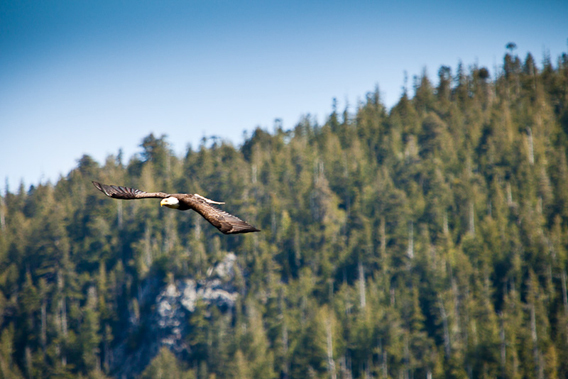 A bald eagle soars over the slopes of the unprotected Upper Walbran Valley on the way to find fish in the river. Photo by: T.J. Watt, Utopia Photo. Watt says: ‘A clear warning sign to travel with caution while on logging roads in BC!’ Photo by: T.J. Watt, Utopia Photo. Adapted from “Saving ‘Avatar Grove’: the battle to preserve old-growth forests in British Columbia” by Jeremy Hance, mongabay.com. Mongabay.com provides news, information and analysis on environmental issues, with a special focus on tropical rainforests. The website features more than 70,000 photos and has a section about forests for children, available in nearly forty languages.